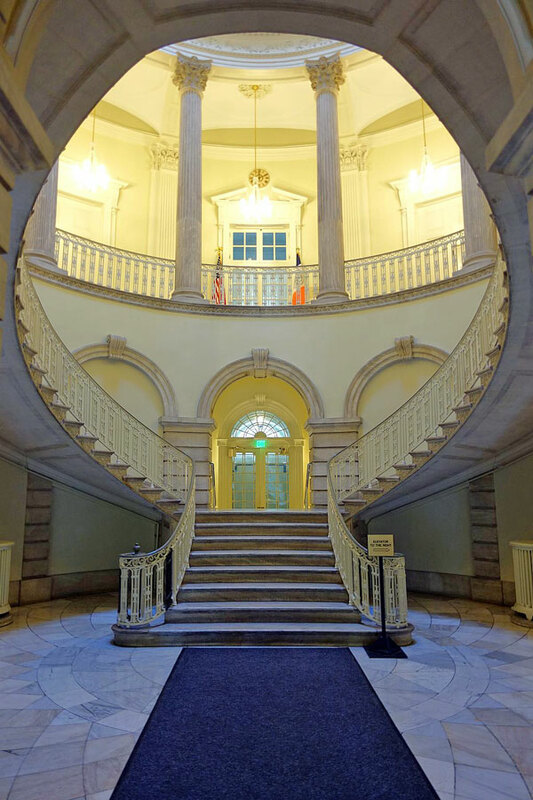 Free tours of NYC’s historic City Hall building are available on Wednesdays at noon. The tours are limited to 20 people and are offered on a first-come-first-served basis. Tour sign-up is at the NYC Tourism Kiosk at the southern end of City Hall Park (at the intersection of Broadway and Barclay Street). You can sign-up on the day of the tour, from 10:00 a.m. and 11:30 a.m..
New York City’s City Hall is one of the oldest continuously operating city halls in the United States. The building was constructed from 1803 to 1812 and is considered one of the most beautiful public buildings of the time. During the tour, you’ll see the beautiful rotunda, City Council Chamber, Governor’s Room, and City Hall Portrait Collection. Tours last about an hour. The City Hall Building is located in the center of City Hall Park in lower Manhattan. The park occupies the area southeast of the intersection of Broadway and Chambers (map). Tourist In Your Own Town #26 – New York City Hall from New York Landmarks Conservancy on Vimeo.